Take the mid-fall colours of southern Ontario, add a world class racing facility with gobs of heritage, mix in about 35 of the newest vehicles available in Canada and you have the recipe for an exciting Canadian Car of the Year 2017 TestFest. Click on the image to open a slideshow. It's an annual affair mounted under the auspices of the Automobile Journalists Association of Canada (AJAC), an intensive few days in which car writers from across Canada converge on Canadian Tire Motorsport Park (nee Mosport) to wring the latest wheels out in what amounts to glorified test drives that give us a decent first impression of what's coming for the next automotive year. 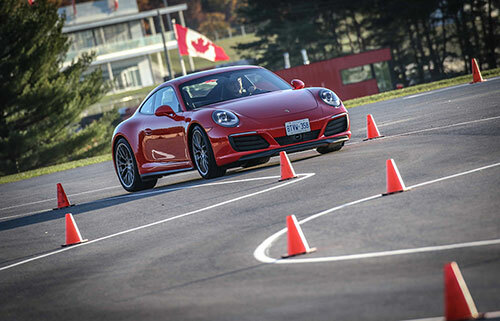 It's also a real blast, especially if your advanced driving courses are up to date, in which case you get to take the wildest of the wheels onto the facility's Driver's Development Track. I, thanks to a course earlier this year courtesy of Mercedes Benz, was current, and positively salivating at the chance to take cars like the new Porsche 911, Mercedes C coupe AMG and BMW M2 onto the tight twisties of the DDT. And I wasn't disappointed. They have real drivers on hand as well, to ensure you don't do something stupid with the high end iron, and their tips came in really handy. Of course it wasn't just super sports cars that were on display at this 29th edition of TestFest. The list really ran the gamut from entry level to high end, on both the car and the utility vehicle side of the equation - and sprinkled into the mix was a selection of so-called green cars, of various colours. TestFest is open to passenger vehicles that are all-new or significantly updated for the current model year. Vehicles are divided into numerous categories defined by vehicle type, pricing, and market segment, including Best New Small Car (and Full Size Car and Sports/Performance Car), Best New Full-Size Premium Car, Small Utility Vehicle, etc. Each of us drives assigned categories, then can expand to other categories once we've finished. I generally try to drive cars that aren't likely to reach Calgary on their national press tours, which usually means I'm going for the high end performance stuff (yep, it's rough), which coincidentally lets me take them on the track. Once we've driven the vehicles (we have to drive each category entry back to back, on the same day, to ensure apples to apples comparisons), we vote on such parameters as interior and exterior design, ergonomics, usability, handling, braking, and more. Those subjective opinions are mixed with objective data obtained by drivers with electric monitoring to ensure both sides of the equation are served. The results, tabulated by KPMG, results in a winner for each category, and the category winners vie in a second round of tabulation to name the overall title of Canadian Car of the Year, Canadian Utility Vehicle of the Year, Canadian Green Car of the Year, and Canadian Green Utility Vehicle of the Year. Besides the performance and handling courses - the latter of which is a course set out with cones on a big parking lot, to test the mettle of "lesser vehicles" - we also take the vehicles on some really nice public roads and, in case of the utility vehicles, an off-road course. The result is a pretty good first impression. The goal is to provide relevant consumer-driven information Canadian shoppers can take with them to the dealerships. My assigned categories have * next to them; the other categories I drove have + signs. Thanks to a couple of family emergencies I had to divide my attention between cars and relatives, and therefore I didn't get to drive all the vehicles I wanted to, but my total of 25 was a pretty good cross section. My favourite was the Hyundai Elantra, an easy choice. I spent a week in an Elantra a few months back and loved it. The South Korean car feels like a German car and that's high praise. Hyundai also entered the Sport version in the Best New Sports/Performance category and I fear it might come in last there, thanks to its competition being the new Fiat 124 Spider (or, as it was dubbed, the "Fiata," since it's basically a Mazda MX-5 at heart) and the outrageous Ford Focus RS. It's too bad, because it was my favourite of the two Elantras and is probably the one I'd buy if I were shopping. I'd spent a week in the Mercedes E Class before, so wasn't surprised at what a great car it is, and I thought the Buick and Cadillac were disappointing (the Cadillac less so than the Buick). The Volvo S90 is ugly inside and out, a real step backward for a company that was making some pretty nice stuff only a few years ago, and its technology/interfaces are different enough from the crowd that they'll undoubtedly take a while to get comfortable with. The Genesis G90 was the real surprise. Genesis was the higher end Hyundai sedan (not including the Equus) and I liked it quite a bit, but this new one represents the beginning of a new, separate Genesis brand (like Acura is to Honda and Lexus is to Toyota, etc.) with a whole new ownership experience. And it's a great car! The only reason I'd be surprised if it won its category is that by the time the votes are all counted I'm usually found to be a voice barking in the wilderness. I loved the "Fiata." As someone who was silly enough to own three MGB's back in early to mid-1970's I've been a fan of the Miata since it debuted, and the Fiat 124 Spider is pretty well the same car, but with a classic 124 look of the old Fiat sports car from the 1970's. If it were up to me, though, I'd give the category to the Ford Focus RS. The Focus is a decent car in its own right, but this one is a beast! It's all wheel drive, with a nice six speed manual transmission and its 2.3 libre turbo four puts out 350/350 (hp/torque). And it goes like heck, emitting the most glorious farts when you most desire them. The downside? $49,064 price, as tested. As mentioned, I loved the Hyundai Elantra Sport, but think Hyundai should have entered it into a less sporting category, where I think it would have done very well. The Porsche 911 Carrera 4S. My dream car for decades, which definitely prejudices my opinions, the new model goes all-turbo (up until now there were turbo and non-turbos on offer) and ups the horsepower and torque to a respective 420 and 368. The other big difference I gleaned from my quick test drive was a new thumb wheel thing on the steering wheel by which you can choose driving modes (it used to be buttons on the crowded centre console). I still love this car, though if someone sat a Jaguar F-Type next to it and made me choose which one to drive for the rest of my life I'd have a tough time. I didn't really have a dog in this hunt, being more of a car guy, but I liked all of them. The Escape has a new and, to me, less interesting grille, the Sportage is handsome, equipped very well and great to drive (and this one didn't have any engine issues that raised their ugly heads). I also like the Rav4, though I wouldn't get the hybrid. Of the three, only the Toyota gave me trouble on the off road course; there was a wet and muddy spot near the end and the Rav4 balked like a temperamental show jumper, forcing me to drive around the pothole. When speaking to a colleague, however, I learned that many people had problems with that section, and with a variety of vehicles, so it was probably Murphy's Law rather than a flaw in the Rav4. Besides, I doubt many people would take any of these vehicles off road into areas as challenging as this course was. I signed up for this because I'd never driven a Maserati before, though this is kind of a weird niche with which to start my Maserati experience. But the Levant S is an awesome vehicle, luxurious and with a lovely sound emanating from its three litre twin turbo V6 (424/428 hp/torque). My only real complaint is that the paddle shifters are so large that the left one gets in the way of the signal light stalk. My other choice would be the Mercedes-Benz GLC 300 4MATIC, which I'd driven before and like a lot. Alas, it was second worst on the off road course of all the vehicles I drove there, though at least I didn't have to drive around the wet spot. My guess for overall car of the year? My heart says either the Genesis G90 or Volkswagen Golf Alltrack (which I didn't drive at TestFest but had for a few days before I left - and which, as is usual with VW's, I loved). Utility vehicle? Kia Sportage or Mazda CX-9 (which I'd driven before TestFest). Now that I've given the kiss of death to some fine vehicles' chances, we have to wait for the category winners to be announced. That'll come on December 6th, followed on January 12, 2017 by the Best New Technology winners (announced at the Montreal Auto Show), along with the top three CCOTY and CUVOTY finalists. Then, on February 16, the Canadian Car of the Year and Canadian Utility Vehicle of the Year will be announced at the Canadian International Auto Show in Toronto (a.k.a the centre of the universe). Finally, on March 22 the Canadian Green Car of the Year will be announced at the Vancouver Auto Show.